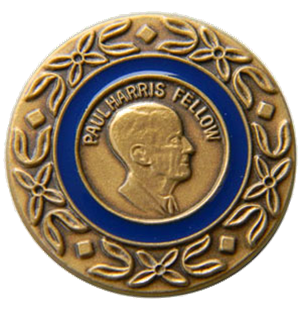 DG Melinda Shafman and I want to congratulate your club and thank these 14 Paul Harris Fellows. I just attended the RI Convention in Atlanta and saw, firsthand, how TRF is making a difference. You should each remember this Paul Harris as it is awarded the year we celebrate 100 years as a Foundation. It is your generosity and caring that enable us to create real and lasting change for those who need it most. Gifts like yours ensure that Rotarians can continue building peace through several avenues, include Peace Fellowships which provide a full scholarship in a Master's program focusing on Peace and Conflict Resolution. (By the way Thank you Doug Russell for participating in our Peace Fellowship interview Tuesday night). Our District supported 2 applications this year and 2 last year. There is no cost to any club or District for endorsing a candidate. TRF provides this full scholarship including expenses. Other ways Rotarians continue building peace is through fighting disease. A District Matching Grant this year was awarded to Billings West to provide audiology equipment for the people in the Community of Neba in Guatemala. Dr. Gene Gukowski of the Billings West club will evaluate and treat patients for a week and provide training for 2 technicians on this new equipment. Rotary strongly believes that providing opportunities to understand people through promoting education and skills training such as microloan and VTT. Another is providing for clean water such as when the Rotary Club of Kootenai Valley worked with the Rotary Club of Mazatenanga to provide clean drinking water to San Juan Maza and La Asuncion School in Guatemala (I remember Sandy Carlson presenting her trip and experience of seeing this firsthand to your club). Supporting maternal and child health, such as last year your club received a District Matching Grant for partnering with local Intermountain Providence Home to establish an effective education program for physical activities and programs for residential youth (ages 4-13). Our biggest effort to date has been to eradicate polio. Can you believe we have had only 5 new cases? This year we may see the last new case of polio. To that end at the Atlanta convention, I don't know if any of you read about it, but there was 1.2 billion pledged for Polio eradication. Led by the Bill & Melinda Gates Foundation who extended the 2:1 matching of funds of up to $50mil/year for the next three years. That's 450 milion! In addition to Gates Foundation, Pakistan pledged 154.7 million and Nigeria 134.6 million. Rotary works because it's a force for good that combines energy, passion and experience. They say there are 2 things that define someone: your determination when you have nothing and your attitude when you have everything. Thank you for your commitment to making a difference.